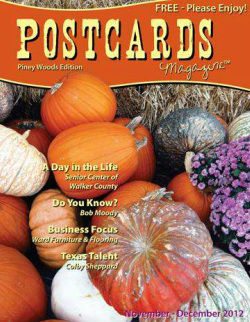 Sandra and I were honored to be included in the Postcards Magazine, Piney Woods Edition - Nov/Dec 2012 issue. A very nice gentleman named Mike Yawn conducted the interview. We were very pleased with the article and the additional traffic that was created to our display and our web site. Thank you Karen Altom - Altom Publishing. NOTE: Altom publishing keeps previous issues online. Please click on the magazine cover shown on the left and it will open the magazine for your to read. What a great birthday present. Our local paper, The Huntsville Item ran a story on our display this year. We have a had a great year and are very happy to have our display showcased in the paper. I dont know how long the Item keeps thier online links active, but here is (was) the link the to artice with a great picture. Thank you to Cody Stark and Matt Weintritt of the Huntsville Item.